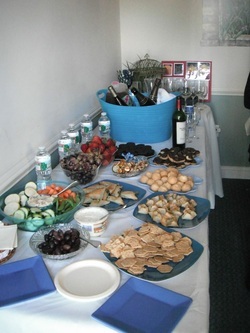 The Sanctuary offers private parties in your home or here in our sacred space at The Sanctuary. We offer Tarot parties, Mediumship parties, Reiki parties, Aura Photography parties, Crystal Bowl private concerts and Ladies Night Out parties which may combine multiple services being offered. A Sanctuary Certified Reader will be selected for your private function which means you can expect professionalism, honest readings with integrity and excellence. Private parties are available for groups of 8 or more. Guests will receive a 15 minute Tarot reading. Guests will each receive a reading with the group. Guests will each receive a 15 minute Reiki Session. Private 2 hour concerts are available for your group of 8 or more. Breathe in the healing vibrations and clearing frequencies of the Crystal Singing Bowls. Float away, ride the spiraling waves, experience the bliss of being lost in the tones, every cell in your body becoming one with the sound. This party will combine several services customized to your needs such as Readings, Reiki and Reflexology. Customers choose which services they want to experience and pay accordingly. Private parties are available for groups of 10 or more. With 15 guests, the host will receive their photo for free. Guests will receive their photo, 2 page computer printout and a short energy reading with Amy. *Travel Fees or higher minimums may apply depending on location and travel time. Contact us for details and we'll assist you in selecting the perfect type of party for your function. ​Please call us at (508) 362-8000 or submit a request here. Contact us with details of your request.